There should be a weight rating on a tag. Gas or Diesel ? How many trucks do you have. I’m sorry for your loss Tom my sincere condolences to you. Does Boone hunt ? 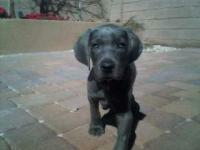 Love me some Weimaraners. Was it a bottle of bourbon? Do you have any savage Axis stocks ? Black, for a 22-250. Ii think U-haul can supply guys to load the truck for you and other guys in Flag to unload. It might be a lot cheaper to go that route. A moving company won't insure your stuff if you box it. Not that their regular insurance is worth a crap. I did that move(company paid for) about 22 years ago and they did charge by weight, but that also included them boxing everthing. They also estimate the job on unboxing everything. You may get a small local company to do it for you at an hourly wage, but most of them only have 22-24ft trucks. (Un)Fortunately promotions have gotten us back to the valley. cafcrazy is good to go. I recently made a purchase from him. I was only disappointed that when we met I didn't see any crazy in him at all. The item I purchased was exactly as described though. Nice to meet you Clint.